In a bid to tackle rural crime in North West Wales, the Rural Crime Team has worked with PACT (Police and Community Trust) to set up a Farmwatch scheme in the area. This scheme was set up after a community meeting was held earlier this year in the local area. The meeting came after a […] Read More. 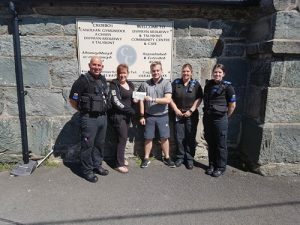 PCSOs in Amlwch have been working with the High Sheriff of Gwynedd’s Crimebeat Fund and the community group Caru Amlwch to hold a host of activities for local young people. Thanks to £400 of funding from Crimebeat, and support from the local Youth and Housing Services, numerous activities were held and included many intergenerational projects to break down […] Read More. Crooks’ cash funds local crimebusters A special fund which uses cash seized from crooks to help community crimebusters in North Wales is set to take its hand-outs to over £200,000 in five years. 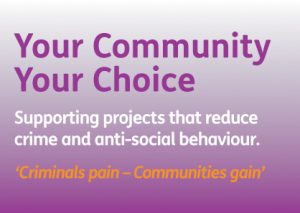 The Your Community, Your Choice Awards are again putting up over £40,000 for local groups and North Wales Police and Crime Commissioner […] Read More. 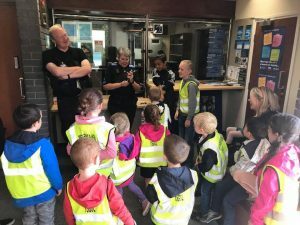 The Porthmadog Safer Neighbourhood Team and Hen Ysgol Nursery are breaking new ground in community engagement with funding from PACT. On Wednesday, August 9, Community Support Officer Paula Stewart presented ‘Hen Ysgol’ Nursery with a Police and Community Trust [PACT] cheque of £200. The money will go towards gardening tools and shed locks for the […] Read More. 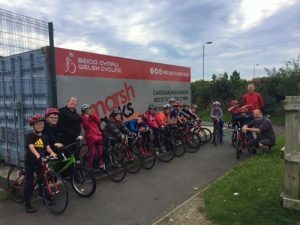 Rhyl South Safer Neighbourhood Team obtained funding through the High Sheriff of Clwyd Crimebeat Fund to work in partnership with Marsh Tracks, Rhyl Cycling Club’s Coach Dave Henley and Rhyl Adventure Playground (RAPA) to host a summer programme of activities for local kids. During the Summer Holidays RAPA have run a series of events encouraging […] Read More. The South Gwynedd Safer Neighbourhood Team have teamed up with the Cambrian Beach Blue Wave Team [CBBWT] to retain the beaches’ blue flags. Plastic on our beaches is a major hazard to the coastal communities. Micro plastics are tiny plastic particles and fibres left over after larger sea waste is broken down and mixed into […] Read More.